Update: This recipe is now on the Caveman Keto YouTube Channel. Check out how to make Almond Buns! I’ve done it. I’ve found the holy grail, the perfect bun. This has been a long journey. First we tried Oopsies and we knew it was possible. We tried peanut butter bread and we were closer. The minute muffin hinted that something better was possible. The flax bun was really close. I now present to you, the Almond Bun! Here is the finished product in breakfast sandwich form. I took all of the feedback from the flax bun and made some improvements in the recipe. Add the wet ingredients and whisk. Distribute the batter equally into the muffin top pan. This pan is one of the secrets to making really good buns. It makes sure that the buns are all of a very even and flat so that it is easy to use for breakfast sandwiches, burgers, etc. If you just make 6 piles this size the edges will be weaker and the form of the bread will be closer to a cookie than a muffin and it will not hold. The dough for this recipe is more dense so it takes some effort to spread it evenly. Here are the completed buns. You want to cook them until the edges just start turning brown. This will vary from oven to oven considering these are pretty flat. I would keep an eye on them the first time and then remember the amount of time it takes. Here is the final product again, this time served as an open sandwich. In the end, I think all of these different faux breads have different advantages and disadvantages. They are all useful to have in your cookbook. The Almond Buns are my favorite in terms of taste and texture. However, there are some advantages to the Flax Buns as well. First, Almond Meal is expensive, coming in at around $9.63 per pound compared to Flax Meal at $3.61 per pound. Also, the almond buns come in at 373 calories and 4 net carbs per bun where the flax meal version was 251 calories and 1 net carb. Both would be really healthy if used as an open sandwich. Neither of these are too high for calorie intake or net carbs but I tried to minimize the calories in the flax buns because my wife was trying to stay under 400 calories for breakfast. Personally, I would use these buns as a treat, maybe for weekend breakfasts or to bring to a restaurant as a bun replacement when eating out with friends. Almond buns - perfect for breakfast sandwiches, open faced sandwiches or as a burger bun. Any other faux breads I should try? Leave a comment either here or on reddit and I’ll give it a whirl and let you know the results! These look really quite nice! Only need to get a muffin top bun and i will be able to give it a try! Woah this weblog is great i love studying your articles. Keep up the great work! You know, lots of individuals are hunting round for this info, you could help them greatly. I just made these almond buns and they are the best low carb bread I have ever had. I love how buttery the buns are. They kind of remind me of biscuits. I like that you provided step by step pictures on how to do it otherwise I’d be doing it wrong like my flat oopsie bread. Thank you for the recipe. Can you this recipe in a bread pan to make it a loaf? Thanks! i made almond buns they were so very good but they stuck to pan. They broke while i was struggling to get them out :(. I even sprayed pam on pans before pouring. Any suggestions? I didnt add sugar since it was optional. Do you think that could cause it? Thank you so much for this recipe, it has changed my life! I went on a low carb diet and kept craving bread and then I found this and now I’m down 40 pounds and can still have the ‘bread’ that I love. My new favorite thing to do with these is make French toast out of them – it’s delicious! Thanks again! I just made these using generic store brand egg rings (I had a hard time finding a muffin top tray) and they came out perfect. They were quite thick, yet not too dense, did not crumble when held and most importantly they cooked evenly. To anyone using egg rings ensure you grease them well, you may need to wait until they’re cool then run a blunt knife around the edge to coax them loose. I may distribute the batter between 8 rings next time, opposed to 6, as the difference in thickness between your buns and mine (heh) is quite significant. Oh, almost forgot, I used a 60/40 ratio of almond meal/ flax meal but other than this I did not alter the recipe. what did you think of the texture, flavor etc by adding the flax meal? I am thinking of doing the same thing…. I did a 50/50 mix of flax and almond meal, but otherwise did not modify the recipe. The almond buns with just almond meal were quite a bit like cornbread. Splitting the mix to 1/2 almond and 1/2 flax, it came out more like whole grain bread. I’ve also made the caveman keto flax buns and the 1/2 and 1/2 buns came out as a happy medium texture and flavor-wise. You only save 10 calories but you do gain some fiber. I think now I’d like to see experiment with swapping some of the butter for olive oil or just reduce the overall oil/butter content. Also interested in trying the 1/2 and 1/2 mix with less butter but add a hard grated cheese and some seasonings. I tried these today but they came out a bit too egg-y. I think I will try your idea of the flax. I’m all for fat, but the butter taste is a little too pronounced. Do you have any ideas for substitutions for at least some of the butter? I’m not very experienced experimenting with baking. Could you use more egg and some coconut milk or something to that effect? You could use a mix of water and oil instead of butter. Or some combination of all three. The flax buns are made with just water and oil to reduce the calories, the same principle would also reduce the butteryness. Another thing is I always use unsalted butter, are you using regular? Maybe I’ll experiment with all three 😛 I’m fine with some butter, I’ve just never been a huge fan of butter (I know, I’m super weird). Do you have suggestions for types of oil? I wonder if coconut oil would make it taste too coconutty. Olive oil? I made the flax buns with coconut oil and they were delicious and not too coconutty, but they stuck to the pan a lot more than they did with butter, so be sure to grease the pan! No other changes were made and I made the muffins as directed. For whatever reason, even when making these as directed, I’ve only been able to make 5 of these in my muffin top pan. I ‘melted’ the cream cheese and butter together in the microwave for about 45 seconds and whisked them together. It looks a bit funky, but works well. The end result was a much less butter consistency and more flavorful. Bottom line, I loved these muffins as is and finding them is an absolute lifesaver! I made these alterations for my preference. Thank you so much for creating this recipe!! I was a bit tired of Oopsies and didn’t find a good replacement for them so far. I am soooooo looking forward to try these almond buns as soon as my muffin form arrives. They look incredibly tasty! I made these with the exact directions but they seemed a bit salty for me. Next time I think I’ll leave out the salt. Also if you used salted butter, try using unsalted butter! I agree that they’re too salty and I did use unsalted butter. I will use 0.5 tsp of salt next time, which coincidentally matches the amount in Caveman_Keto’s flax bun recipe. Not complaining though, this is a fantastic recipe and I loved my cheeseburger. I noticed that since yesterday, he has removed the salt from the base recipe. I used salt yesterday, and found it too salty, so today I reduced that to 0.5 TSP salt and added 0.5 TSP onion powder as a substitute. It definitely changed it up some, reduced the salt taste dramatically, and gave it a light oniony taste which was awesome for my breakfast muffin. I put bacon, cheese and egg on it. This recipe calls for WAY too much salt. Use 1/2 tsp instead. Yeah, I think I should change it, the last couple times, I’ve omitted the salt entirely. There was a post on reddit with a bun made out of pork rinds called Meat Bread. I think you should play around with it! The Trader Joe’s almond meal I think is quite a bit coarser than Bob’s Red Mill. The Bob’s is already really small like flour. Maybe try Bob’s or grind in a seed mixer? How did it taste with Trader Joe’s Almond Meal? It’ s A LOT cheaper than Bob’s, but it is much more corse. The problem with Trader Joe’s is that it is a much coarser grain than with Bob’s. You could probably refine Trader Joe’s yourself in a food processor though. 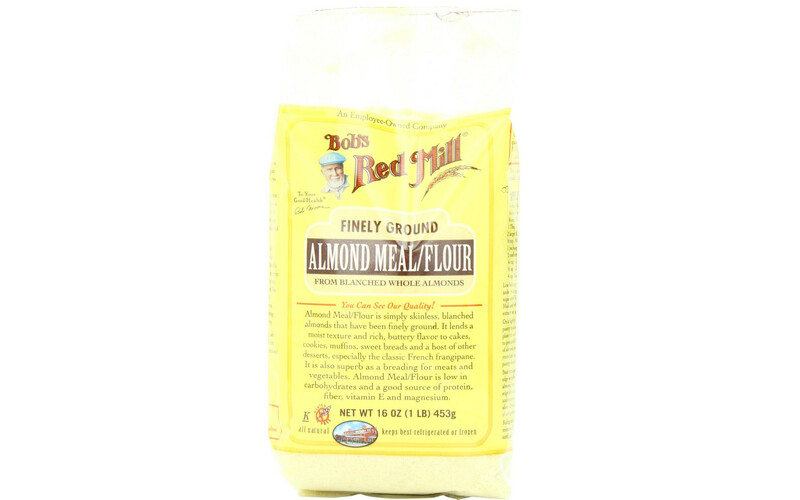 Get your Almond flour from nuts.com. It’s the best Almond flour for cooking and baking! I placed an order for a cast iron muffin top pan after seeing this, and I plan to make these very soon! Thank you for the idea. Discovered your site yesterday and these almond buns are now cooling on the counter! I have also been on a quest and made many faux breads. I can tell these are going to rock! Looking forward to making the stuffed bacon wrapped shrimp next. Also- if you order almond flour from Honeyville website (5 lb bag) it brings the price down to about $7 per pound. That is the cheapest I have found it. Thanks for your inspiring recipes! Thank you so much for this awesome recipe. My hubby is on the keto diet (mostly for weight loss) but my son is on the spectrum and therefore, like many, intolerant to gluten, casein, and so much more and trying to limit carbs as they feed the yeast in his bowels. So this recipe is just perfect for us! For a casein free and maybe lower calorie version, I use a mild tasting olive oil instead of the butter and they turn out great! Thanks again, can’t wait until tomorrow’s breakfast! 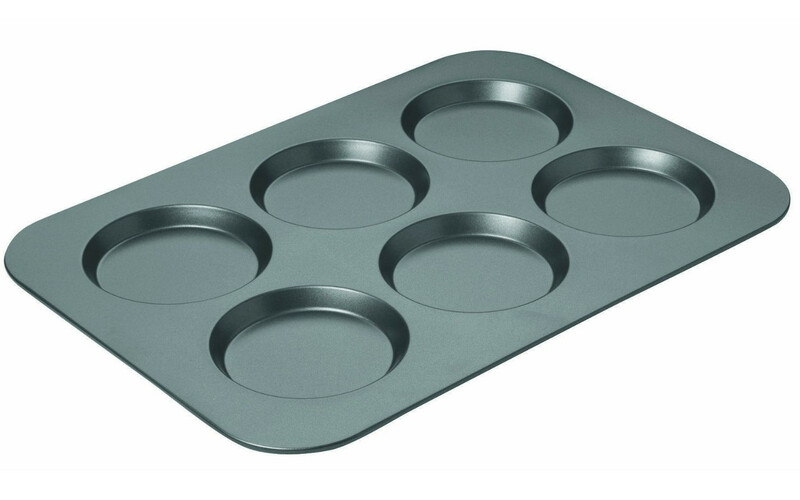 I’m still waiting for my muffin top pan to come in – but I found one with 12 smaller “wells” at the local Wally – made my first batch to sample. Awesome! Gears are grinding now…I’m thinking cinnamon, 1/4 tsp of vanilla extract, a bit more sweetener to taste and voila! Faux snicker-doodles! I love these things but does anyone have trouble getting them in the muffin top tray? I find they’re so sticky I can’t use my hands because they stick to me rather than the tray, same with a spoon. PLEASE help me with this, I seem to destroy every batch I make. I just whipped these up for the first time. I used a mini-muffin tray and got about 18 mini-biscuits. This is my first experience with fake bread so I can’t compare against anything else, but it’s delicious and satiated my craving for bread. Test successful, will go find a muffin top tray this week. Thanks! First–re. “buttery” substitute? If you really want them savory, why not use olive oil and even add garlic salt instead of regular salt? They’d be more “mediterranean” in that way. Secondly, virtually everything I’ve cooked using almond flour is too salty–I think salt is accentuated with that ingredient somehow and have learned to use less. 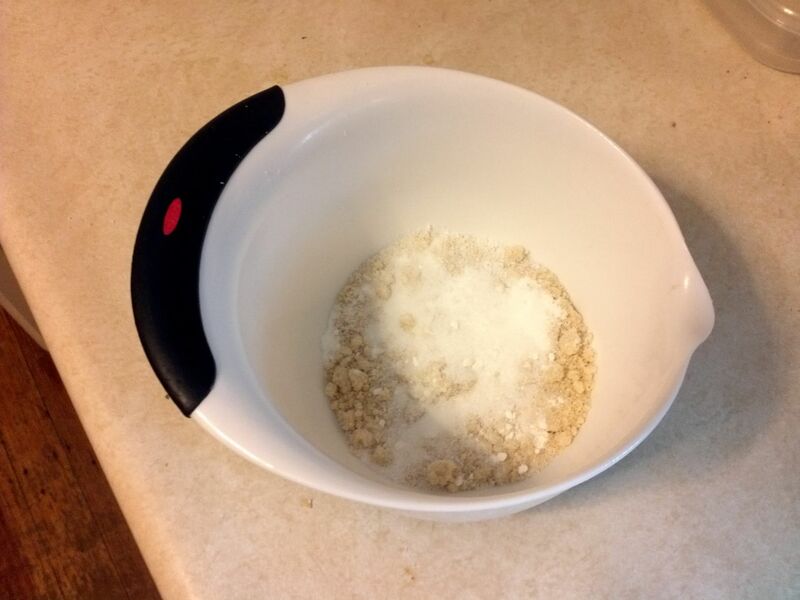 Third, the “Bob’s Old Mill” Almond flour is great–and if you want it to stay that way, put what you do not use in a ziplock bag and keep it in the freezer–otherwise the natural oils in the almond flour will go rancid fairly quickly once exposed to air. I make my own almond flour with a VitaMix now, and remember–almond flour is heavier than wheat flour so making it FINE helps the eggs and baking powder lift it and make it light–otherwise it can wind up more “clay-like” in use, so yes, finer is better always, but its natural oils make it “clump” a bit so you have to mix it more thoroughly. That’s why so many of the recipes out there like the “oopsies” have you separate the eggs and fold in beaten egg whites separately (though with this recipe that isn’t necessary because oopsies don’t use baking powder which creates bubbles that give the bread its lift–they rely entirely on the egg white foam to do it.) IF you have never baked much before, the best way to think about baking is this: Cooking is art, but Baking is art by way of SCIENCE. The chemical reactions, the air mixture that gives breads and rolls their “crumb”, and all of the interactions of ingredients and proportions matter much more than in other cooking, and just “putting in a bit more” or less of something may have major results, good or bad. Thank people like this who’ve done the spadework for you, and when in doubt stick to the recipe. Have you tried coconut flour for a bun like this? May be the next iteration for these? It’s cheaper than almond flour and should provide a good taste as well. How on earth do you cut the bottom of a tuna can off? Nowadays the cans have rounded bottoms that I can’t open with my can opener. If you have a Trader Joe’s nearby, they sell a pound of almond flour for 4.99. They also sell almonds by the pound for 4.99 if you want to grind your own. My local TJ’s was out of the flour, so I made my own. It’s grainy but the buns come out great. I’ve been making these for about a month now and every single time I can not help but be amazed at how well they turn out. These are almost impossible to screw up. They are FAST to bake, and require very little effort to prepare. A fork, a whisk, and your ingredients. I made these for thanksgiving and they were a huge hit with my non-keto family! My grandfather, who is over 80 years old, asked me for the recipe so he could make it himself. It’s very rare I can convince him to try something new. My only suggestion, as someone else said, is to try to come up with a coconut flour bun! (So I can use my 2lbs of it!) Thanks so much CMK! I was about to complain about how bitter these were when I re-read the recipe and noticed I mistakenly used baking soda instead of powder. I’ll give this another shot tomorrow. Ok, made these for the first time tonight! Went great with our meal of keto friendly chicken fried steak, gravy, and green beans, as a side. I’m so inspired now! Can’t wait to play around with these. May try them in a muffin tin to make more of a roll? Maybe adding some garlic powder, etc. to make them more savory. Also, thinking about adding a little cream to the batter thin it out, add some cinnamon and sweetener and make pancakes! Thanks so much for this awesome recipe! I don’t have access to a muffin top pan, would you say that the batter is thick enough to be portioned out and shaped by hand? I don’t mind them being a little mishapen, more concerned with the batter running. I actually decided to give it a shot anyhow, I added a little more almond meal to make it a little stiffer so that I could heap it on to a baking sheet with a ladle. It came out great! It’s a little crumbier than I’d like, but I am using homemade almond meal rather than storebought flour (it’s crazy pricey in Toronto, if you can even find it) so that probably accounts for it. I wanted to test out the flavour so I made a little sandwich out of one bun cut in half, with just some cheddar and spinach, and it’s fantastic. Definitely gonna have to make some more. I bought a muffin top pan just to make this recipe! I made this in a pie pan and it reminded me a lot of corn bread. It was very tasty. Made breakfast sandwiches with these if you use the muffin top pan and scramble 4 eggs with sausage crumbles you make perfectly sized egg and sausage patties just thrown them in 350 for 12 minutes top with a slice of cheddar and you’re good to go, Make sure you grease the pan. Mine are in the oven as I type this (Feb. 16, 2013) and I had the same experience, i.e. my batter was more of a batter (think “Pancakes”) instead of a thicker dough (such as gluten-free bread mix). 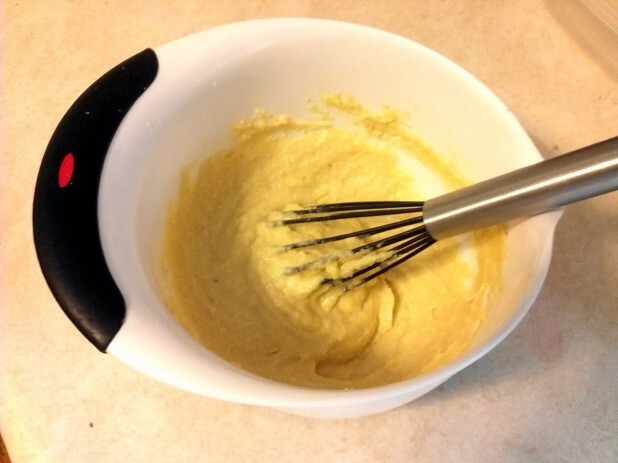 I believe I should have mixed the wet ingredients into the dry, then let the batter sit for, say, 15 minutes. For anyone else searching through this like I did. I had the same runny/thin/liquid batter and they turned out perfectly fine so don’t worry. This recipe is brilliant! I doubled it and made six larger buns which I then sliced horizontally through to make each burger. The only thing I didn’t double was the butter – I used 4 tbspns butter and 2 tbspns coconut oil instead and the flavour was delicious. I didn’t have any muffin pans so I used individual pie tins instead – worked a treat! I just made these, but after reading some of the comments used 4tbsp butter and 1tbsp water, they are GREAT, really excited to have found your page, thank you! Thanks, this was great! Tasted a lot like cornbread. 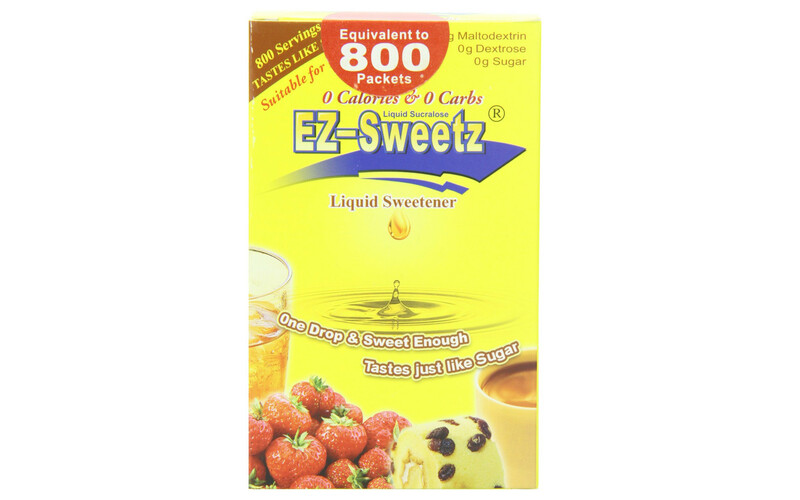 I used Stevia In The Raw instead of Splenda. OMG we need a PRINT function for this stuff!!!! can you add it to your list of little icons with “share/FB/pinterest/etc”?? To throw another post on the pile: I made these as stated and they are very good. A touch flaky, like cornbread, but still delicious. Thanks for posting it! I’m about to give these a go. Cheeseburgers maybe? Have you ever tried “Farinata?” I made pizza last night and used Farinata as the crust. It was excellent! Farinata is so easy and delicious! I’m just getting started with keto and wondering your thoughts on Farinata. It’s made with garbanzo flour. I’d like to know if it meets keto requirements. I tried to paste the Nutrition Facts here but it went nuts. http://www.bobsredmill.com/garbanzo-bean-flour.html. Thanks! Did them on parchment paper, and they came out great. I did add a quarter cup of extra flour (1cup total in reference to this recipe) to thicken them up because of the lack of a muffin pan on my part. Great recipe! I buy my almond flour (as well as most of my food) from Azure Standard. It’s roughly $4.50 per pound. Very good stuff. Check out their website to see if they have a drop in your area. I get my coconut flour through them too for roughly the same price. If you don’t have Azure Standard where you live, Honeyville Grains has almond flour for roughly $7/lb after shipping. They have discount codes all the time if you sign up for their emails. Possibly stupid question regarding the nutrition information: is it 7G carbs per muffin, or for the whole recipe? Hey Caveman, first I love your blog and the recipes you create are awesome. I had a thought about the carb count and cost comparison of the flax vs almond buns. Have you tried using a mix of the two products to produce an almond/flax hybrid? Anyways thanks for the blog again, and keto on! Hopefully this helps someone–Here in Utah (~4800′ elevation) it took 25 minutes in the gas oven @ 350. I made this and my base mixture before cooking seemed a little dryer than it looks in the picture, why would that be? I used 6Tbsp of butter instead of 5Tbsp also. Having said that they came out delicious! Hmm, it could be the size of the eggs or the type of almond flour. If your eggs have less volume then that could be the issue! I love your recipes!. I tried to sign up for your newsletter, but nothing happen. Will you please sign me up. Thanks! I actually don’t have a newsletter, just pinterest and RSS! Just a quick question. I noticed that on the bag of Almond Flour at the store’s site says that it’s 6carbs/serving with each serving being 1/4 cup. This recipe calls for 3/4 cup (3 servings). How is it possible for the total carb count to be at only 7? ..Stupid question.. I need to refrain from communicating past 2am.. If anyone else makes this silly mistake, it’s because the carb count is for the serving size, not the whole recipe. Much sturdier than oopsies. Thanks yet again. I’ve made these several times and absolutely love them! Tonight, I decided to add 6 strips of crispy bacon, 6 tablespoons of cheddar and two diced green onions before I baked them. They are the perfect little breakfast muffins for when I get tired of eggs. Caveman, thank you so much for all your wonderful recipes!! 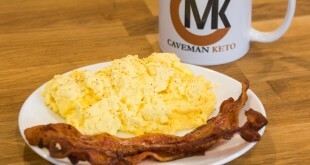 Mine turned out amazing: http://bit.ly/18QYi9S I love you cavemanketo. This is my new favorite keto site! Amazing! Taste just like corn bread. I can not wait to eat this with chili. I double this recipe and use almond meal to make an almond bread loaf and then fry as one would make french toast and it is absolutely amazing and full of flavor! Thank you for sharing this!! Just made these! I used half butter half coconut oil (because I had fat bombs in freexer) and made them in a yorkshire pudding tray. I got 4 large ones. I actually asked for the tray for my xmas present!! Freeze? In an air tight container or a paper bag in the bin? yay! I just picked up a Yorkshire pudding tray @ Marshall’s today to use for a almond flour biscuit, I was hoping I could use it for this recipe as well, so glad they didn’t turn out too big! I didn’t have any almond flour, so tried this with soy flour. Tasted the batter (blech), but made them anyway and figured I would give the result to the dog. Cooked in my Hamilton Beach Sandwich maker. The first one was undercooked, and the dog was glad to get it. The 2nd one I left for 5 minutes, and it came out perfect. Tasted with trepidation, but to my surprise it was wonderful! Both flavor and texture were great — added some cream cheese and could only finish the one (very very full!). I only got 3 out of the batch, and the batter needed to be spread rather than poured, but I will experiment some more with it! Thanks for finally giving me a bread substitute that is tasty! I am blown away by how easy and satisfying these are. I’m not a wizard in the kitchen by any means, but these came out goldeny delicious and completely satisfied my cravings for something kind of bread/biscuit-y on my first try. I also like that they’re insanely fast to prepare. I can’t wait to make a breakfast sandwich with one of these buns, a couple over-easy eggs, bacon, and some aged cheddar cheese tomorrow morning. YES!!!! Thanks for the recipe and to everyone for the instructions in the comments. These are delicious and really look like buns too. Best of all, they held my sloppy joe and coleslaw without falling apart. 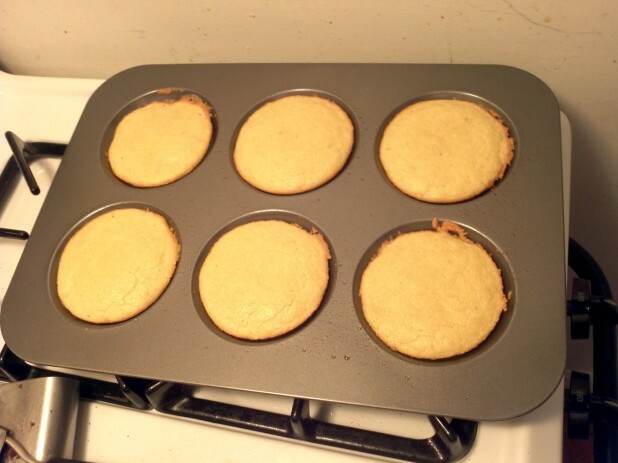 So, for the next reader, I’ll give some tips… I didn’t have the muffin top pan. I used 2-cup ramekins. First time around I greased them well but the buns were hard to remove and I lost one of them to crumbs. Second time I still greased the ramekins but also put a round of parchment paper on the bottom. Perfect! I also did use Trader Joe’s almond meal but followed the advice to grind it more finely first. I subbed some refined coconut oil for part of the butter. Thanks again! They are not flexible enough to fold; they would break. I finally got around to trying these, and I really like them! I went ahead and used salted butter an no added salt, and that was fine for me, but I think it’s just a matter of personal taste. In my second and third batches (because, yes, they are so good I keep making more! ), I have come to completely omit any sweetener and reduced the baking powder to 1 tsp so they wouldn’t puff up as much in the middle. I use Bob’s Red Mill almond meal/flour, and my batter is much thinner than in the photos here, but I bake mine at 350 for 14 minutes, and they are perfect! Just made these tonight for the first time. They are AMAZING! Tasty and perfect as an open face sandwich with some bacon and a runny egg on top! I’ve been missing bread lately, and had bought almond and coconut flour but didn’t know where to start. As soon as I found your recipe yesterday, I made these and they’re lovely! They remind me of my “fat” cornbread (fat as in butter, or bacon grease, or duck fat to be fancy) that I’ve not made for 6 months since starting to eat LCHF. These really hit the spot, and fulfilled my most important qualification, that they are not just “faux” but tasty all on their ownsome. I made these with salted butter and without sweetener, and my brain’s dancing with possible future variations. Probably because of the butter, they were just as tender and good today as they were yesterday. Thank you and bless you for your ingenuity! THANK YOU Cavemenketo! I just made these for the 1st time, right now, and I used 4TB butter and 1TB expeller pressed organic coconut oil (Jarrow Brand which does NOT taste like coconut) – and they turned out great! 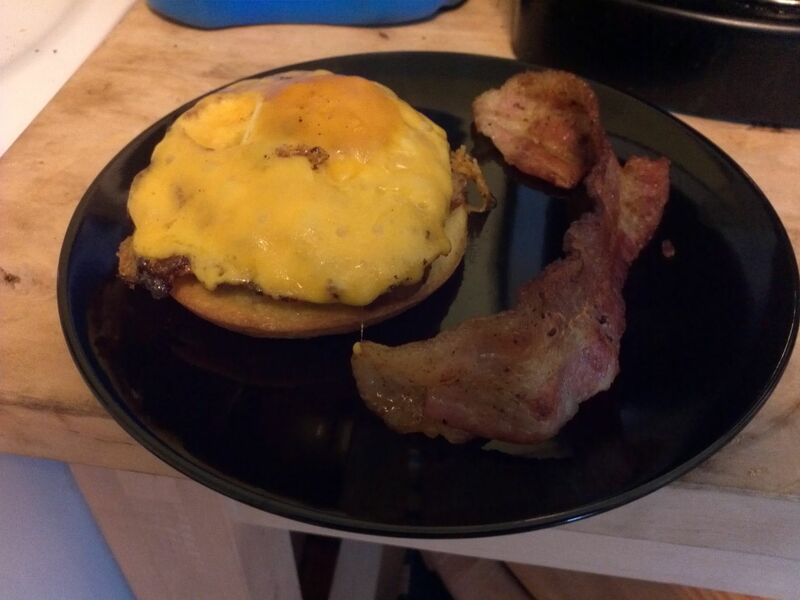 I used them for open face breakfast sandwiches and I used crispy bacon as the “top bun”. I’m not a big fan of eggs so I split 1 egg between 2 sandwiches and it was so good. 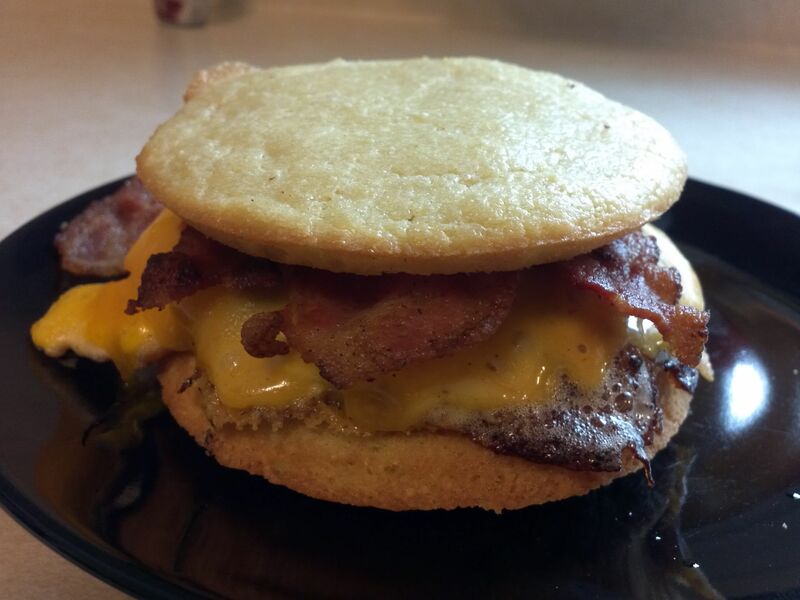 My husband is not doing keto, but he loved the sandwich I make him as well, however I used 2 buns for his sandwich and he asked me to put a little maple syrup on the bottom bun. He was raving about it. NOTE: There is a big difference between almond meal and almond flour. This recipe calls for almond FLOUR. For the Almond Buns, would a 50/50 mixture of flax seeds & almond flour/meal work, or would a mixture of 75/25 work better (25% being the flax meal)? This is just a suggestion for those that feel 100% almond flour is too much. I just made these and love them. How is the best way to store them for a week. Hi! I made these tonight, and although they turned out fairly alright, there’s a slight bitter aftertaste. Is that just the almond flour? It’s the first time I’ve used it. What could I have done wrong? Thank you! Love this recipe, Thanks,Caveman. I like the Splenda in the recipe. I do, however, add a large pinch of salt. I sometimes add chopped jalapeños and shredded cheese. Delish. I also start with melted oil of choice, and then beat in room temp eggs. Next, I beat in combined dry ingredients. This eliminates scary lumpy stage. Sometimes, instead of baking in muffin top pan, I fry on a hot griddle and make Johnny cakes. I bet you could probably pour them into a waffle iron. That’s my next experiment. I did make them into Keto Waffles one time! Thank you so much for this recipe, the well written directions, and the great photos. I used a 80/20 mix of almond flour and flax meal, 3 egg whites, and 4 tbsp of butter and 1 tbsp of olive oil and these came out terrific. (I also used 1/2 ts of stevia.) I could gobble them down straight out of the oven. I haven’t had a good hamburger since I started my low carb diet and now they are going back on the menu!!! Thank you for the time you put into this and for sharing, it is greatly appreciated! Found your recipe in the nick of time as my boyfriend and I both woke up jonesing for “something on a bun.” The only change I made was out of necessity – I used almond meal since that’s what I had on hand. Perhaps it was due to this change, but the texture was a bit like cornbread, which was the perfect compliment to our melted ham and cheese sandwiches. This one’s definitely a keeper! Are these safe to leave out, or would you say to refrigerate them? I like to split one muffin in half instead of using two. This way I don’t have to have an open faced sandwich. One muffing sliced around the perimeter holds together nicely. 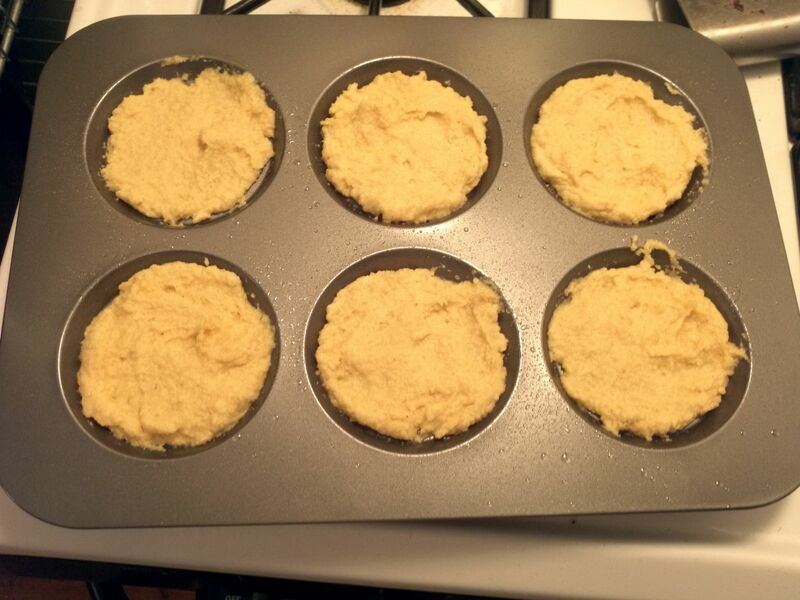 The muffin pan leaves an impression around the outer edge of the muffin. I use this to score it with a butter knife and then slowly slice it in half. I used 4 Mason jar rings, well greased, to hold these as they baked instead of using the muffin top pan. I placed the Mason jar rings on parchment paper on a cookie sheet and baked for 15 minutes at 350. They turned out AWESOME and 4 seemed to be perfect – that size allowed me to cut each one in half to make a sandwich. Used these as a garlic cheese bread by toasting in a pan, and sprinkling with garlic salt and havarti. Winner. Took the last one, and used it as a ‘shortcake base’, and topped with a bit of french vanilla whipped cream, and a couple fresh blackberries. Evrn bigger win. Thank you!! Any idea how long they keep if making a double batch? I had a weird Wilton cookie pop pan that had only 4 divets, so I made 4 larger buns instead of 6. It was the perfect size to slice in half for a breakfast sandwich! thanks for the recipe. they were very tasty and kinda sweet… i think i will use with stevia chocolate chips and make big cookies :). Hello. I love your website and your recipes and all the details. The details are important! Just made these last night for my Saturday morning breakfast and they are deeelicious! Would just like your input on a few things. One, I forgot to leave the ingredients out at room temperature and I wonder if this is why they turned out slightly thicker than yours. And two, I used almond meal b/c I didn’t have almond flour. Are they virtually the same and would that affect the recipe? Thanks so much! You rock! I wanted to let you know that, indeed, this is an AWESOME recipe. SO awesome, that with just a few little tweaks, it becomes WAFFLES!!! I know you proudly posted Carbquik waffles on your homepage less than a month ago, but these babies are AMAZING!!! I recommend putting it in a high-speed blender or hitting it with an immersion blender to try to break up the chunks a little better, or they can get a little crunchy, but they are DELICIOUS!!! Makes about 2-3 x 7″ waffles. Can I make it in a loaf pan and slice it? I’m wondering the same. Have you tried it yet? I eat Paleo-Keto so i made these with coconut oil. It made them sweet. I didn’t have a muffin top tin so I used a glass 8×8 pan cooked at 350 for about 15-20 min. I also used a small pan to cook some just to see the difference. I’m new to keto so I was happy to find this, thanks. Can you add fiber husk to these to make them more firm? I just made them, tasted amazing but they are kinda like danish cakes, almost crumble in my hands. Maybe I added a bit too much butter? Would be nice if they were firm to use like a burger bun. I imagine taking the butter down would just take moisture out of the mixture, and result in a more dry end result. The more dry the more crumbly. Just made these following recipe with only a tiny pinch of salt, poured batter about 1/2″ deep in each large muffin pan well and hoped for the best. I was so pleasantly surprised when I tasted one…the most delicious muffin ever! In fact, they were so good that I just whipped up a second batch to have more for the rest of the week. Just made these and I used one under my fried egg. Brilliant! I have been missing that so much. Will make these over and over. these look wonderful and everyone’s comments are helpful. Thanks. I just tried this recipe and it is absolutely amazing!!! I’m very new to the paleo way of eating and cutting out sugar and breads is the hardest thing I’ve ever had to do. I made these in a regular muffin tin and they turned out like fluffy little breakfast muffins or corn muffins. So tasty! And delicious with almond butter and strawberry jam on them! Definitely a must try recipe. It got me through my insane bread craving tonight. First off, these are freaking amazing. I’m on Day 50 of my Keto diet and have missed the hell out of anything bread-related. 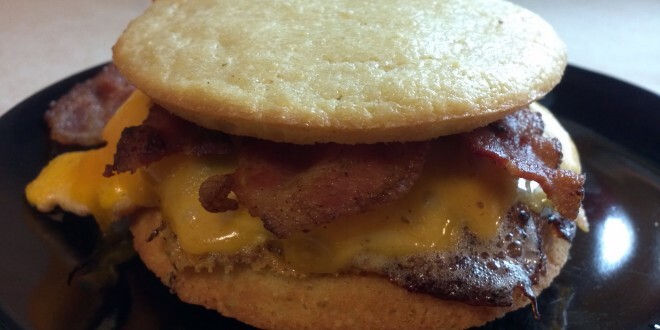 This is an almost cornbread texture muffin…use as a side for dinner (with soup!!!!) or as a breakfast sandwich or just with some butter, holy cow are these good. I like them just as much as any other muffin I’ve made. Only change to the recipe was I used salted butter because that’s what I had on hand. Only complaint is, they’re small, and not the texture I like when it comes to a hamburger bun. I’m going to try these again but instead put the batter in my tart pans to make them a little bigger…hope that works out. Are they going to be better than eating my burger on a piece of lettuce? Absolutely. Amazing recipe, but I wouldn’t call them the holy grail keto hamburger bun…I’d call them the holy grail dinner/breakfast biscuits. I retract the hamburger bun statement…it was another website that referred to these as hamburger buns. My mistake. Your site refers to them simply as buns, which is a good description. A+ recipe. Best keto-anything recipe I’ve found yet. Would a Whoopie pie pan work for this you think? I made these and they came out like corn bread. Nice surprize no i know how to make keto cornbread however i wanted a bun. It fell apart in my hands. I did not have a muffin top pan ao used a muffin pan. Any suggestion as to why the fell apart so easy? I made these and my non-keto family members were eating them. My only issue is I felt they were a bit to dry so my husband suggested subbing in half coconut flour or maybe some greek yogurt or coconut oil. I was thinking of making a sweet version of them by using Lily’s stevia sweetened chocolate chips and making chocolate chip muffin tops? Any suggestions? Have you ever made a bun like this with psyllium husk in the recipe? There is a mistake in the calorie count of one almond bun. Where you write “the almond buns come in at 373 calories and 4 net carbs per bun” it’s not per bun but rather per two buns. I did my own calculation and reached 191 calories per bun. Great recipe! Cheers! I’ve been Atkins-ing off and on for years. These almond buns, at 4 net carbs, are exactly what I’ve been looking for because bread is one of the things I crave the most. All the other recipes (like oopsie rolls) taste eggy. Pingback: Week 1; preparations and food.Keto. Fat. Carbs. | Keto. Fat. Carbs.